ONE OF THE most memorable moments of the 2016 Rio Olympics occurred prior to the 200-metre butterfly when Michael Phelps was shown with a menacing and somewhat disgusted look on his face while his chief rival, Chad Le Clos of South Africa, was shadow-boxing-dancing-something in the foreground. 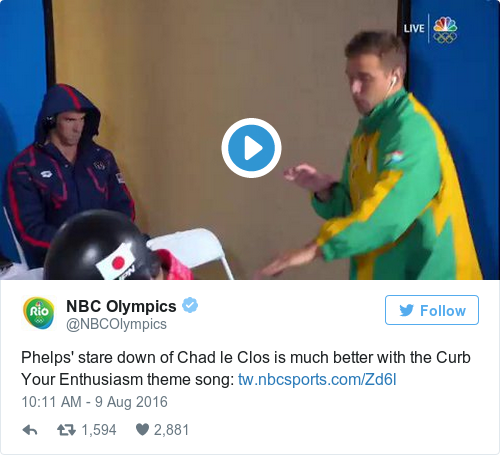 Many assumed Phelps was annoyed by Le Clos and whatever he was doing. But no matter the reason, in those few seconds, a meme was born: #PhelpsFace. Intel recreated that moment in a new commercial starring Phelps and Jim Parsons. While the commercial has Phelps mimic the PhelpsFace as the result of a slow computer, with a fake Le Clos dancing in the foreground, the best part comes at the end. That’s when Parsons asks Phelps what Fake Le Clos is doing. We still don’t know either, Michael. Email “Michael Phelps takes not-too-subtle dig at Olympic rival in new ad”. Feedback on “Michael Phelps takes not-too-subtle dig at Olympic rival in new ad”.